Eating healthy starts at the grocery store. That is where you make your first decision if you are going to eat healthy or not. It is not always an easy decision, especially with all the sweet and savory foods that are on display. That is why you must go in prepared! 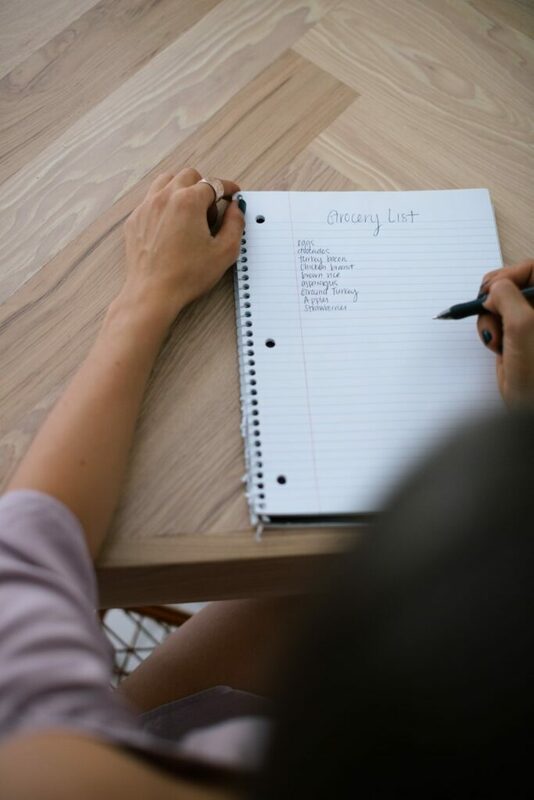 Taking a few minutes to create a healthy grocery list will get you in and out quickly and leave you eating clean! Start your list with 7 different categories: Meats Protein, Fruits Veggies, Grains, Dairy Eggs, Snacks, Condiments and Drinks. Once you have those set you can start creating your grocery list. Below I have listed some of the most important things to remember for each category. I also put some of my favorite things if you get stumped. -Grill meat when possible. This will help reduce any additional fat. -Swap ground beef with ground chicken or turkey to lower the fat content. -If supplementing with a protein powder use whey isolate, pea or plant-based protein. Make sure that it has at least 20-25g of protein per serving. Faves: Skinless chicken breast, 99% lean ground turkey, salmon, halibut and tilapia. -Frozen fruits and vegetables are fine to add to your list. Just make sure that they are all natural with no added sugar or juices. -Eat fresh and local produce when possible. -The more greens the better. Faves: Apples, strawberries, raspberries, bananas, broccoli, bell peppers, carrots, asparagus, Brussel sprouts and spinach. -Make sure you are eating whole grains. Especially in pastas and breads. -Look for “Whole wheat flour” as the first ingredient. Faves: OatFit Oatmeal, Steal cut oats, Dave’s killer bread, Ezekiel bread and Long grain brown rice. – Cow’s milk is usually high in sugar so I recommend swapping it for unsweetened almond milk or coconut milk. -Plain greek yogurt. Add your own fruit to keep sugar content in check. -Eggs that are high in Omega-3. Faves: Unsweetened Vanilla Almond Milk, Chobani Plain greek yogurt, Free Range Omega-3 eggs. -Most condiments are high in sodium, sugar and fat. Some better options include: Sea salt, pepper, hot sauce, extra virgin olive oil, Bragg’s seasoning and yogurt based dressing. Faves: Bragg’s liquid aminos, Cholula hot sauce and Bolthouse farms yogurt based dressing. -Snacking is when a lot of people fall of the healthy eating train. Usually because they are unprepared. Plan ahead with some of these healthy snack options: Pre portioned nuts, precut fruit and veggies, protein bars and nut butter. Faves: lightly salted almonds, bell peppers, grapes, Rx bars, almond butter with apples. -Most people don’t factor in their liquids while they are trying to eat healthy. Keep your drinks just as clean as your food to avoid drinking empty calories and added sugar. -Infused water, sparkling water, green tea and coffee. Faves: Homemade mint cucumber infused water, La Croix sparkling water, China mist unsweetened green tea and Chameleon vanilla cold brew. -Never grocery shop hungry. This will help avoid impulse purchases or over buying because your eyes are bigger than your stomach. -Try to do most of your shopping on the perimeter of the store. This is where you will find the most natural, whole and fresh foods. -When in doubt keep everything lean,clean and green. -Last but not least, Plan ahead! Even if you are making the list in the grocery store parking lot before you walk it, it will help keep you in check.